Melbourne sure has been getting some heavy rainfall and storms recently. And there’s more rainfall coming this weekend. So if you find your backyard, front yard, bbq area, carport, garage, basement or any other part of your house or property is getting flooded out, don’t hesitate to call us. We are experts at clearing blocked stormwater drains. And quick action can prevent further damage. You don’t want that water sitting around, causing damage to buildings, foundations, paved areas, gardens, retaining walls etc. Call The Drain Man today and we will fix the problem fast, with specialised plumbers who really know what they are doing. And every one of them works for us directly. Fix the flood. 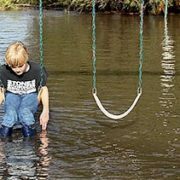 Call The Drain Man on 1800 843 372.
https://cdn.frankly.com.au/tdm/uploads/2015/07/flooded-swings-e1420782874385.jpg 211 464 Frankly SEO https://cdn.frankly.com.au/tdm/uploads/2018/03/the-drain-man-logo-new-2015.png Frankly SEO2015-01-09 17:07:082018-04-23 05:23:32ALL FLOODED OUT?